A wedding is just the kind of celebration that demands some color. And when someone says color, which country crosses your mind first? 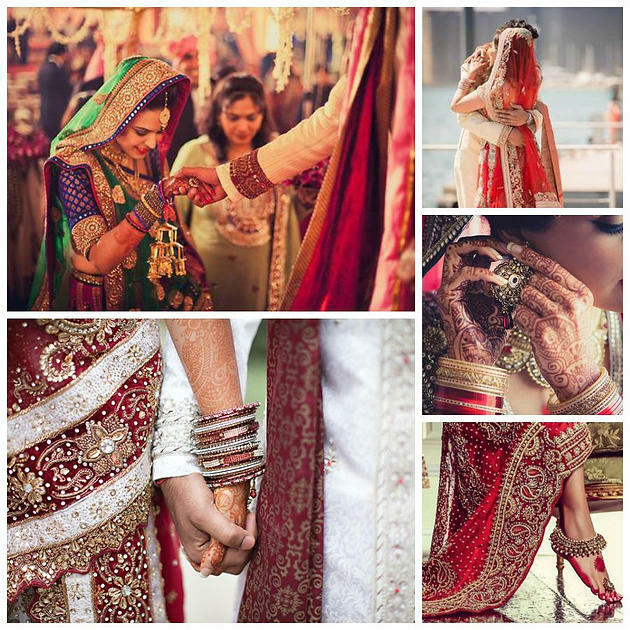 It is, of course, Indian culture, which is becoming a popular inspiration for the “I do” day. It is your new something new, something old (traditional) and something blue (in all colors actually). 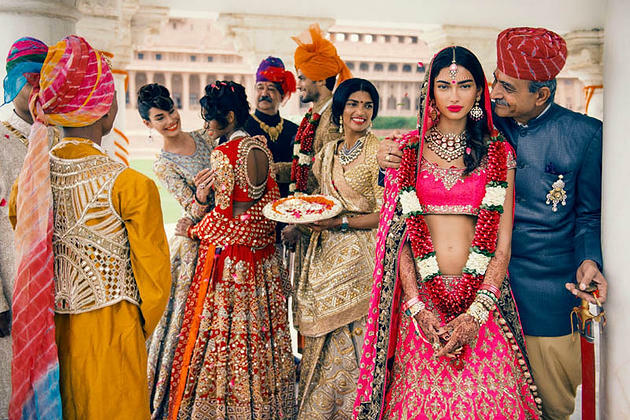 From the photogenic details such as henna on the bride’s hand and decorations to spicy authentic Indian dishes, the Maharaja themed wedding is a package of happiness and joy. 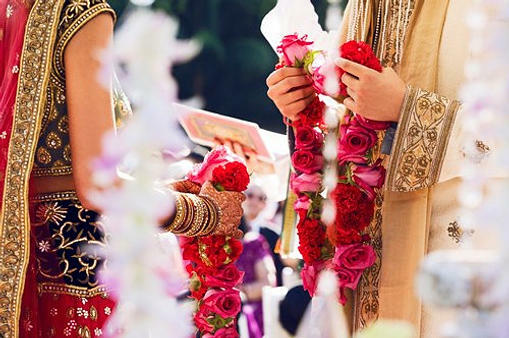 Besides, the Indian royal weddings have always been a synonym for elegance and that is something everyone wants to have on that special day. So let us dive in into the magic of the opulence Maharaja weddings can provide. Just remember the event which New York Times marked as the “wedding of the decade” in ’87. It wasn’t some fancy European ceremony, but the extravagant Princess of Gwalior and Yuvraj of Kashmir union in marriage. The marble, Kashmir, golden decorations and amazing colors are some of the many things that placed this wedding on the map. And though practically no one can recreate such decoration, who can blame us for trying? If you are aiming to make an Indian feast for the eyes, you can create some lighting focus spots which will shine in different colors, place luxury crystal candelabras at the tables, create an extravagant and eclectic mish-mash of flowers and shiny centerpieces, search for interesting details such as tiny camel or Indian symbols. Small elements, like antique chairs, bright ethnic cushions, ghungroo (bells), jhoola (swing), statement garland piece, flower curtains, etc. will bring out the charm of the incredible India. 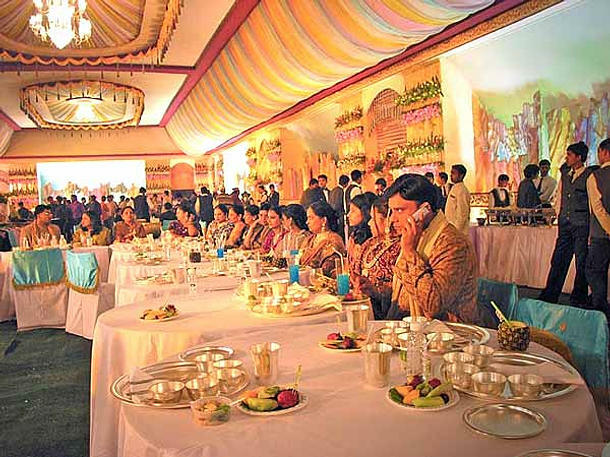 Indian weddings are famous for their sumptuous food. Spicy and tingling meals are on the menu of every decent wedding in this amazing country, so you should include them in your own, if you decide for Maharaja wedding inspiration. You must have several vegetable dishes, various types of dals (stew), breads and pulaos (risotto). The menu should consist of a lot of creamy curries, tandoori meat, banana leaves served dishes, halvas, sabzis and barfis. Basically, you are supposed to aim for both quality and quantity. Indian-inspired wedding is a great chance to show off with delicious, tongue burning, taste buds lovable dishes. So, the point is the more the merrier. Some extravagant weddings have even a 100+ dishes on the menu. Perhaps the best part of Indian wedding. Not only the bridal wear, but all Indian designer sarees worn by the wedding guests are a joy for the eyes. Traditional bridal saree should be red with golden embroidery. The fabric of choice is usually silk. Today, however, the views have expanded, and there is a variety of colors and fabrics to choose from. The only thing that matters is that colors are joyful. So don’t fear to choose pink, yellow, purple, orange or golden saree. The amazing makeup with the accent on the eyes and shiny conspicuous jewelry make the whole event even more magical. Henna on the bride’s hands is an inevitable detail. For the husband-to-be, there are interesting modern variations of traditional sherwanis and pajamas. A wedding day should be a dream come true. And as Romain Rolland once written: “If there is any place on the face of earth, where all the dreams of living men have found a home from the very earliest days when men began the dream of existence, it is India”.